This freezer challenge is only three days old but I'm loving it. Before I left home yesterday I took three pizza bases, a packet of grated cheese and some frozen salami out of the freezer for the boys to use on their MOO pizzas. I spent the morning shopping with Mum, no problem resisting freezer food there though. I picked up the milk and mushrooms needed and that was it. But yesterday afternoon I spent working on a story and of course it involves food, creating a dilemma for me. There is an upside and a downside to this dilemma of mine though. The downside is that I won't be taking any of the things I bought (for the story) out of the freezer, so I won't actually be using up my freezer stock. The upside is that while normally I'd just prep the food and add it to the freezer stockpile, now I'm doing this challenge that's not going to happen (I'm being very strong here!). Instead I've chopped and peeled and cooked and vac sealed and it is all in the fridge and I'll use it up over the next couple of weeks. Today I've taken out some chicken frames and a bag of soup veggies to make chicken soup. It is going to be cold here (and just about everywhere else on the east side of Australia) this weekend. The weather bureau has mentioned the coldest weekend for 30 years so a pot of soup will not only feed us but warm us too. And it's two packages out of the freezer. We're having chicken soup instead of the pumpkin soup on the meal plan for tea tonight, and probably for lunch tomorrow too. There may even be enough for lunch on Sunday! I'll shift the pumpkin soup to another night later on, it wasn't made so there's not going to be any waste. I took the roast for Sunday night out of the freezer this morning too. It's in the fridge thawing so it will be ready to go on the barbecue Sunday afternoon. The freezer is already beginning to have gaps between the bags, not bad for just three days. I can't wait to see how much room I'll have for restocking after a month! How are you going with your freezer challenge? Can you see empty spots in your freezer yet? 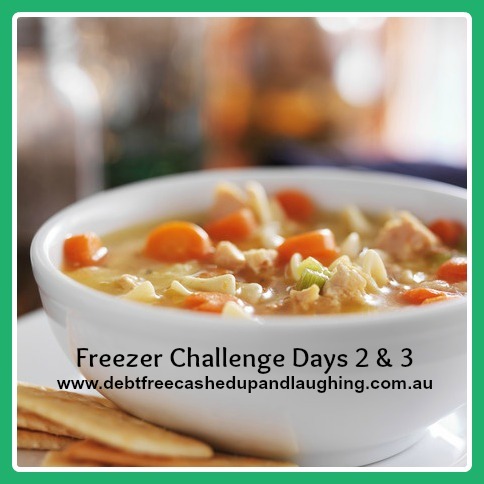 Oh Cath I really need to do this challenge, my freezers are so full they are bulging! I think the weather is going to be too cold for me to be digging in the freezer this weekend lol! We are due to have the same cold front here in South Australia. I find that loaves of bread and odd shaped things really mess my freezer up. Sometimes a good re-organise can fix things for a little while. I did however just restock with chicken breasts that were on special so I have extra in there. As soon as an empty spot appears in my chest freezer and I feel like I am getting somewhere, it is not long and it is refilled with something else!